or familiar with Windows programming and Microsoft Visual Studio. Application: This layer processes data from the HAL layer. It is written by developers. HAL: Hardware Abstraction Layer. This layer packs/parses the data to/from the Driver layer. It is implemented by the sample code (for UART) or SDK library (for USB), e.g. libDJI_guidance.so. Driver: This layer receives data from the Guidance system through USB/UART. It is implemented by OS or 3rd party libraries, e.g. libusb. The Guidance SDK supports two communication protocols: USB & UART. The supported data types are Velocity Data, Obstacle Distance Data, IMU Data, Ultrasonic Data, Greyscale Image, and Depth Image. There are two ways to subscribe the data through USB. 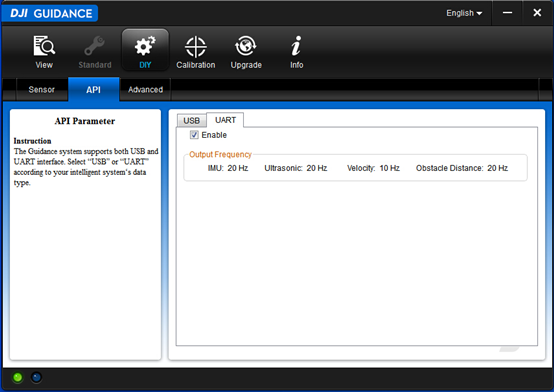 User can use Guidance assistant software to subscribe the data in "DIY->API->USB" tab. Notes: The available bandwidth is subject to the selection of image data and the output frequency. The selection of subscribed image data and output frequency will be saved and take effect when the Guidance system is turned off and on again. User can subscribe the data using Guidance API. Identity these API functions that are named with "select". Notes: If user subscribes the image data and output frequency using Guidance API functions, it will only temporarily override the data selection that is made in the Guidance Assistant software when the Guidance system is still powered on. However, the data selection that is made through the Guidance API will not permanently change the data subsections options stored in the Guidance system, unless you de-select the "Enable" option in the "USB" tab. The output data types of UART are Velocity Data, Obstacle Distance Data, IMU Data, and Ultrasonic Data. Image data are not output via UART due to the bandwidth limit. Note: Guidance UART only supports 115200 baud rate. 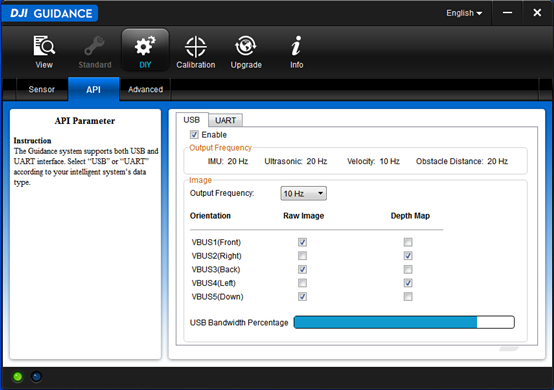 You may only use Guidance assistant software to subscribe UART data. Enable this selection from "DIY->API->UART" page. Same as USB, the configuration will be saved in Guidance Core, unless you de-select the "Enable" option in the "UART" tab. ① Frame data size can vary, 1007 is the maximum length. ② The index of this field depends on the length of the data field. Each of the supported data types is described below. Error Code enumerates possible error codes. When error occurs, usually an error code will be given, and the developer can reference this enum to find the error type. Velocity Data: velocity in body frame. The unit is millimeter/second and the frequency is 10 Hz. Obstacle Distance Data: obstacle distance from five Guidance Sensors. The unit is centimeter and the frequency is 20 Hz. IMU Data: IMU data including accelerometer (in unit of acceleration of gravity g) and gyroscope (in quaternion format) data. The frequency is 20 Hz. Motion Data: Pose and velocity data including quaternion orientation, position in the global frame, velocity in the global frame. Ultrasonic Data: Outputs ultrasonic data from five Guidance Sensors, including obstacle distance (in unit of meter) and reliability of the data. The frequency is 20 Hz. Greyscale Image: Outputs Greyscale images for five directions. The image size is 320*240 bytes for individual sensor. The default frequency is 20 Hz and can be scaled down using API functions. Depth Image: Outputs depth images for five directions. The image size is 320*240*2 bytes for each direction. The default frequency is 20 Hz and can be scaled down using API functions. Disparity Image: Outputs disparity images for five directions. This data is useful when developers want to further refine the disaprity images using functions like speckle filter. The image size is 320*240*2 bytes for each direction. The default frequency is 20 Hz and can be scaled down using API functions. Description: Define error code of SDK. e_timeout: time out during USB transfer. e_libusb_io_err: IO error returned by libusb library. This can be caused by physical connection problem of USB. e_OK: Succeed with no error. e_load_libusb_err: Load libusb library error. This is caused by the inappropriate libusb library. e_sdk_not_inited: SDK software is not ready. e_hardware_not_ready: Guidance hardware is not ready. e_disparity_not_allowed: If your Guidance is working in standard mode with obstacle sensing function activated, disparity or depth image is not allowed to select. The reason is, obstacle sensing has its own way to select disparity images. e_image_frequency_not_allowed: Image frequency must be one of the enum type e_image_data_frequecy. e_config_not_ready: Configuration data is not ready. 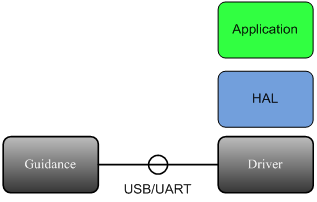 When Guidance is powered on, it takes several seconds (sometimes longer) to initiate, including loading configuration data (including other data) into memory, and sending to application layer (i.e. the SDK software). If the users start SDK application before configuration data is ready, this error will be thrown. Configuration data includes: Guidance working mode, Guidance Sensor online status, stereo calibration parameters, and so on. e_online_flag_not_ready: Online flag is not ready. Guidance system allows users to use any number of sensors, from 1 to 5. We use an array of online status to indicate which sensor are online. If users subscribe data from a sensor that is not online, no data will be returned. e_stereo_cali_not_ready: Stereo calibration parameters are not ready. The calibration parameters are useful for 3D applications. As the images are already rectified, no distortion coefficients are provided, but only coordinates of the principal point cu, cv, focal length focal, and baseline baseline. Description: Define logical direction of vbus, i.e. the direction of selected Guidance Sensor. Note that they are only defined by the VBUS ports on Guidance Core, not by the Guidance Sensors. The comment of each element indicates the default direction when Guidance is installed on Matrice 100. However the developers can install Guidance in any manner on any device, thus the directions might also be different. Description: Define frequency of image data. The supported frequencies are: 5Hz, 10Hz, 20Hz. With more images selected, smaller frequency should be selected. Description: Define image data structure. For each direction of stereo camera pair, the depth image aligns with the left greyscale image. m_greyscale_image_left and m_greyscale_image_right are both 320 hight, 240 width, 8 bit grayscale images. m_depth_image is 320 hight, 240 width, 16 bit depth image. Every 2 bytes describes the depth of a single point (in big-endian format), with the lower 7 bits being fraction and higher 9 bits being integer. m_disparity_image is 320 hight, 240 width, 16 bit depth image. Every 2 bytes describes the disparity of a single point (in big-endian format), with the lower 4 bits being fraction and higher 12 bits being integer. Description: Define ultrasonic data structure. ultrasonic is the distance between Guidance Sensor and the nearest object detected by ultrasonic sensor. The Unit is mm. reliability is the reliability of this distance measurement, with 1 meaning reliable and 0 unreliable. Note: Due to noise in the distance measurement, it is recommended to filter the data before use. short            ultrasonic[CAMERA_PAIR_NUM];     // distance in mm. -1 means invalid. Description: Define velocity in body frame coordinate. Unit is mm/s. Description: Define obstacle distance calculated by fusing vision and ultrasonic sensors. Unit is cm. Description: Define IMU data structure. Unit of acceleration is m/s^2. Description: Calibration parameters of cameras. All values will be zero if the corresponding sensor is not online. Description: Parameters of camera exposure. When m_expo_time = m_expected_brightness=0, return to default AEC. float         m_step;       // adjustment step for auto exposure control (AEC). Default is 10.
float         m_exposure_time;  // constant exposure time in mini-seconds. Range is 0.1~20. Default is 7.25.
unsigned int  m_expected_brightness;// constant expected brightness for AEC. Range is 50~200. Default is 85. Description: Define global motion data. Unit is m for position and m/s for velocity. The Guidance API provides configuration and control methods for Guidance with C interface. Here is an overview of the key methods available in this API. Please reference the protocol of Section 2.1.2 and also the example code of uart_example when using UART transfer type. Description: Callback function prototype. The developer must write his/her own callback function in this form. In order to achieve best performance, it is suggested not performing any time-consuming processing in the callback function, but only copying the data out. Otherwise the transfer frequency might be slowed down. Parameters: data data read from Guidance. Return: error code. Non-zero if error occurs. Description: Clear subscribed configure, if you want to subscribe data different from last time. Description: Initialize Guidance and create data transfer thread. Description: Subscribe IMU data. In standard mode, IMU data can only be output when Guidance is connected to DJI N1 flight controller. While in DIY mode, IMU data can always be output without connecting to a flight controller. Description: subscribe velocity data, i.e. velocity of Guidance in body coordinate system. Description: Subscribe rectified greyscale image. Description: Subscribe disparity image, which can be filtered with functions such as filterSpeckles. Description: Subscribe global motion data, i.e. velocity and position of Guidance in global coordinate system. Description: Set frequecy of image transfer. Note: The bandwidth of USB is limited. If you subscribe too many images (greyscale image or depth image), the frequency should be set relatively small, otherwise the SDK cannot guarantee the continuity of image transfer. Description: Inform Guidance to start data transfer. Description: Inform Guidance to stop data transfer. Description: Release the data transfer thread. Description: Set callback function handler. When data from Guidance comes, it will be called by data transfer thread. Parameters: handler function pointer to callback function. Description: Get stereo calibration parameters. Parameters: stereo_cali_pram Array of calibration parameters for all sensors. Description: Get the online status of Guidance sensors. Parameters: online_status Array of online status for all sensors. Description: Get the type of devices. Currently only support one type of device: Guidance. Description: Get the size of image data. Description: Wait for board ready signal. This function waits 20 seconds for Guidance board to get started. If 20 seconds pass and the board is still not ready, return a timeout error code. The users usually do not need to use this function, as it is already called in init_transfer. Return: error code. Zero if succeed, otherwise e_timout. Description: Set exposure mode and parameters. Parameters: param pointer of exposure parameter struct.